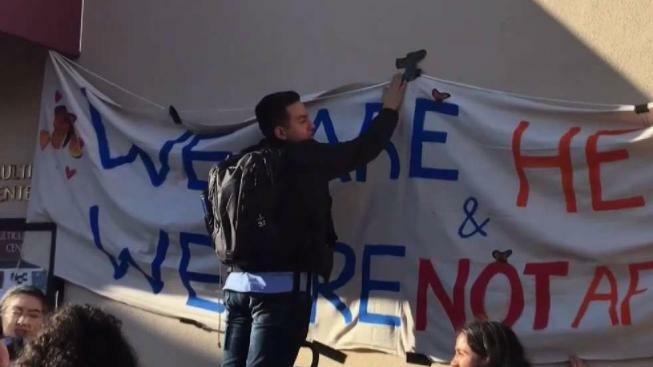 Santa Clara University has become the latest campus to be hit by what some are calling hateful anti-immigrant messages. Posters have been showing up on college campuses nationwide in a campaign spreading anti-immigrant rhetoric. SCU student groups are voicing their anger over the posters and disappointment with the school’s response. The fliers appeared on campus on Monday, and students with Undocumented Students and Allies Association, or USAA, have been meeting to respond and show solidarity. The student group linked to the school’s multicultural center put up a banner of their own, stating "We are here ... we are not afraid." The anti-immigration poster seen Monday twisted feminist slogans with hashtags: No Means No and My Borders, My Choice. "It’s just very hurtful," student Diana Mendoza of USAA said. "You want your university to be your home, and when it doesn’t feel like a home, it really stops you from the way you’re learning, the way you’re studying, the way you’re eating, the way you’re sleeping." The banner was not the only response. There were all sorts of signs, fliers and posters on campus Thursday supporting immigrants. "It empowers me to actually want to do something and to respond in a way that’s positive, to make them see that we’re not any different than they are," ," said Marlene Cerritos, another USAA member. "If anything, we’re more compassionate." Santa Clara University issued a statement, saying it is conducting an investigation and acknowledging the importance of listening to diverse viewpoints while emphasizing respect and civil discourse. Some student groups said the response was late and lacked support. "I think the situation just proves we need a resource center, specifically for undocumented students and students with mixed status families as soon as possible," Mendoza said.